Every year, humans advance climate change and global warming – and quite likely our own eventual extinction – by injecting about 30 billion tonnes of carbon dioxide (CO₂) into the atmosphere. A team of U of T scientists believes they’ve found a way to convert all these emissions into energy-rich fuel in a carbon-neutral cycle that uses a very abundant natural resource: silicon. Silicon, readily available in sand, is the seventh most-abundant element in the universe and the second most-abundant element in the earth’s crust. The idea of converting CO₂ emissions to energy isn’t new: there’s been a global race to discover a material that can efficiently convert sunlight, carbon dioxide and water or hydrogen to fuel for decades. However, the chemical stability of CO₂ has made it difficult to find a practical solution. “A chemistry solution to climate change requires a material that is a highly active and selective catalyst to enable the conversion of CO₂ to fuel. 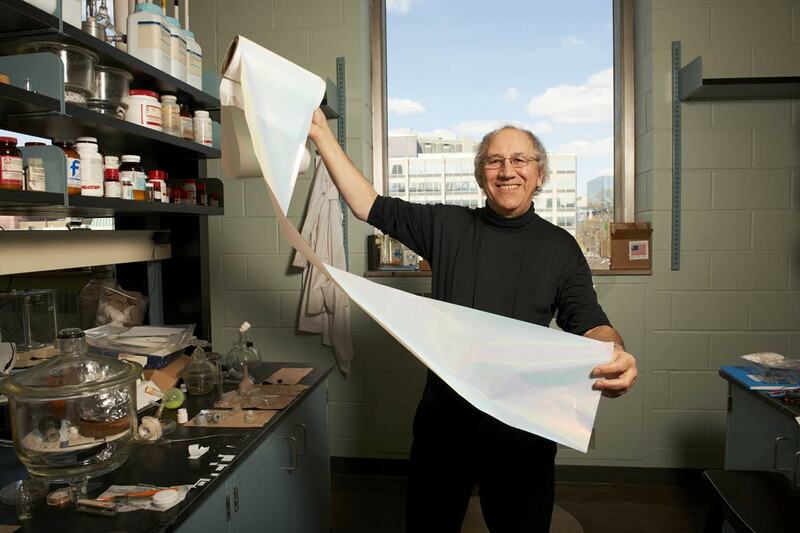 It also needs to be made of elements that are low cost, non-toxic and readily available,” said Faculty of Arts & Science chemistry professor Geoffrey Ozin, the Canada Research Chair in Materials Chemistry and lead of U of T’s Solar Fuels Research Cluster. In an article in Nature Communications published August 23, Ozin and colleagues report silicon nanocrystals that meet all the criteria. The hydride-terminated silicon nanocrystals – nanostructured hydrides for short – have an average diameter of 3.5 nanometres and feature a surface area and optical absorption strength sufficient to efficiently harvest the near-infrared, visible and ultraviolet wavelengths of light from the sun together with a powerful chemical-reducing agent on the surface that efficiently and selectively converts gaseous carbon dioxide to gaseous carbon monoxide. The potential result: energy without harmful emissions. The U of T Solar Fuels Research Cluster is working to find ways and means to increase the activity, enhance the scale, and boost the rate of production. Their goal is a laboratory demonstration unit and, if successful, a pilot solar refinery. Amr S. Helmy – Edward S. Rogers Sr. Department of Electrical & Computer Engineering, Faculty of Applied Science & Engineering.